There is no doubt that bill of lading is the most important aspect of commercial shipping. In my view the close second is the sampling of the cargo. Just as we need to be watchful for bill of ladings, we need to be equally concerned about sampling procedures we adopt. As per Swedish club, cargo contamination is the current major issue for chemical and product tankers. It would not be wrong to say that it is most costly type of claim too. The cost of cargo carried on board chemical tankers is sometimes more than the value of ship itself. And as such if the cargo is off spec at discharge port, it could be a disastrous situation. If the cargo is off spec during loading, there are two main sources for it. Contamination before the manifold valve and contamination after the manifold valves. Our job is to ensure is that there is no chance of contamination after the manifold. But even when the contamination is on the shore side, the onus to prove same is always on the ship. Valid samples is the only way to prove that the contamination was not because of ship. There are four samples a ship may have to take depending upon the nature of the cargo. Shippers never allow ship staff to do shore tank sampling. As such manifold samples are the nearest possible proof to show the condition of the shore cargo. As manifold is the first point for cargo to enter into the ship system, any contamination after this is considered to be because of ship. This makes the manifold sampling the most important one. We take manifold sample with the manifold valve closed. The sampling need to be witnessed by the shipper surveyor. What we need to check in this sample depends upon the cleaning requirements of the tank for this cargo. For cargo requiring visual inspection, we check this sample for any visual impurities, water content and color of the cargo. If the cargo requires wall wash sampling of tanks, apart from checking the sample visually, we need to do the wall wash test of sample. As a minimum we need to check the manifold sample for HC and Chloride tests. If the visual or wall wash test of the manifold sample fails, vessel must not open the manifold valve. The cargo surveyor will most likely drain some cargo into the drums. After draining, we need to take the manifold sample again. We can only open the manifold valve when the sample looks OK. The final manifold sample then need to be sealed in presence of cargo surveyor. We need to put appropriate sticker on the manifold sample. The sticker need to have all the information and must be signed by cargo surveyor. If cargo surveyor refuses to witness or sign manifold samples, we must issue a letter of protest. Some terminal may not allow the sampling with the closed manifold valve. This may be because of terminal regulations or because of type of pump they have. For example we cannot close the manifold valve if the shore pump is of positive displacement type. In this case we can take a running sample of manifold and then lodge a protest to the terminal for not allowing manifold sample. Pump stack sample is important while loading wall wash cargoes. We do not want the cargo in the tank to fail because of dirty cargo lines. And even in the event of cargo failure, we need to be sure that it was not because of cargo lines. To avoid this, we must take the sample from near to the point where cargo enters into the tank. This drain is before the drop valve but the sample can also be taken from the drain before the discharge valve. Again we need to check the pump stack sample in the same way we checked manifold samples. In case sample do not pass, we need to follow same procedure we followed for manifold samples. That is we need to drain some cargo into empty drums and draw the samples again. We must only open the drop valve when the pump stack sample passes. First foot sample is taken for sensitive cargoes like methanol, Ethanol and MEG etc. But why do we need first foot sample. To understand the importance of first foot sample, lets assume that we are loading into a tank. The tank specifications are length 15 meters, width 15 meters and height 15 meters. The volume of this tank will be 3375 m3 (L x B x H). As you can see, with only 2 % cargo loaded, it can cover 32% of the cargo tank area. 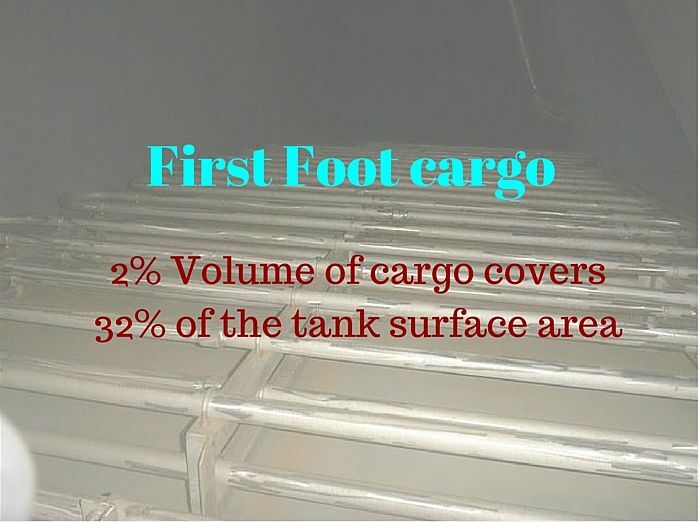 Any contamination because of dirty tank surface should show up in 1 foot of cargo. This avoids the bigger claims if cargo is damaged after loading into the cargo tank. Also during tank cleaning all the impurities gravitate to the bottom. So the upper part of tank is always better cleaned than lower part. So it is a fact that if first foot sample is pass, the final sample after loading will pass. After tank has one foot of cargo, cargo loading is stopped. Manifold valve, drop valve and discharge valve are closed. We then start the pump and collect the sample from the first available drain on the cargo line. The sample is then sent for lab analysis. Only when Lab analysis passes, further loading can be resumed. 2) Do re sampling of the first foot. Make sure that the sample bottle is clean and there is no other source of contamination such as dirty hands. 3) If the second analysis also fails, call P&I representative after consulting owners/ship managers. This off spec first foot cargo would then be required to unload. If there is difference between the specs of manifold sample and first foot sample, the owners has to bear the costs of the cargo as well as delays. Failure of first foot is a difficult situation for the ship staff to be in and the only way to avoid it is by having a tank that is cleaned to the required standards. After completion of loading , a final sample from each tank will be taken by the surveyor. 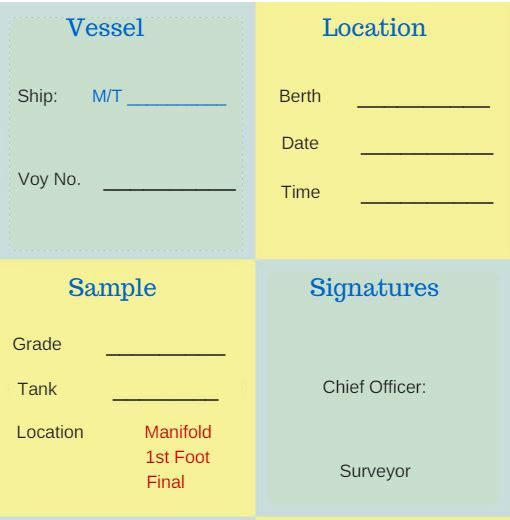 If the cargo is loaded in more than one tank, shipper might also require a composite sample. 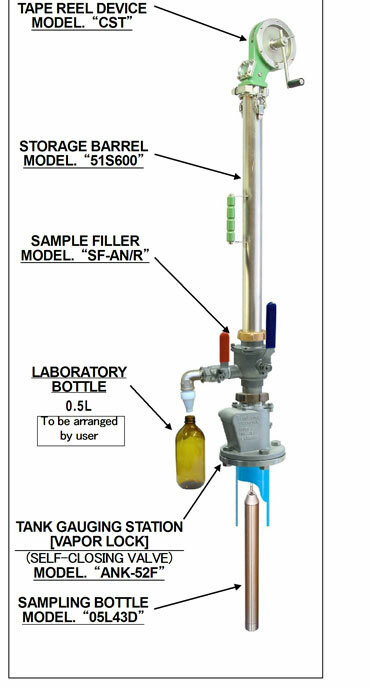 Composite sample is one combined sample with cargo sample from multiple tanks. At discharge port, consignee surveyor will draw the sample from the ship’s tank. These samples will be sent for analysis. If sampling from pump stack drain, cargo must be recirculated for few minutes before sampling. Vessel must not commence the cargo operation until the analysis has passed. If sample analysis fails, we must inform the owners/Charterers. At the same time, we must request the surveyor to take the sample again. In this case, recirculate the cargo for few more minutes before taking the samples. If the sample fails again, local representative of the P&I club should be contacted. It is important that vessel has the load port samples witnessed by the attending cargo surveyor at the load port. These samples would be the only defense vessel will have in case of off spec cargo at discharge port. In all cases of cargo claims, you must not hand over any samples to anyone without consultation with P&I surveyor. There have been many instances where vessel did not have any cargo samples from load port. And as such, owners had to pay a huge amount of money for the cargo loss even when cargo did not damage on ship. This is common when the shipper has loaded a cargo which has different specification to what receiver was expecting. In this case, even when lab analysis result will be same as load port, but receiver will fail the test. Because they are testing with different values as reference. To avoid claims in this situation, Load port samples are the only defense for owners. It is not enough to take the required cargo samples before loading and discharging. 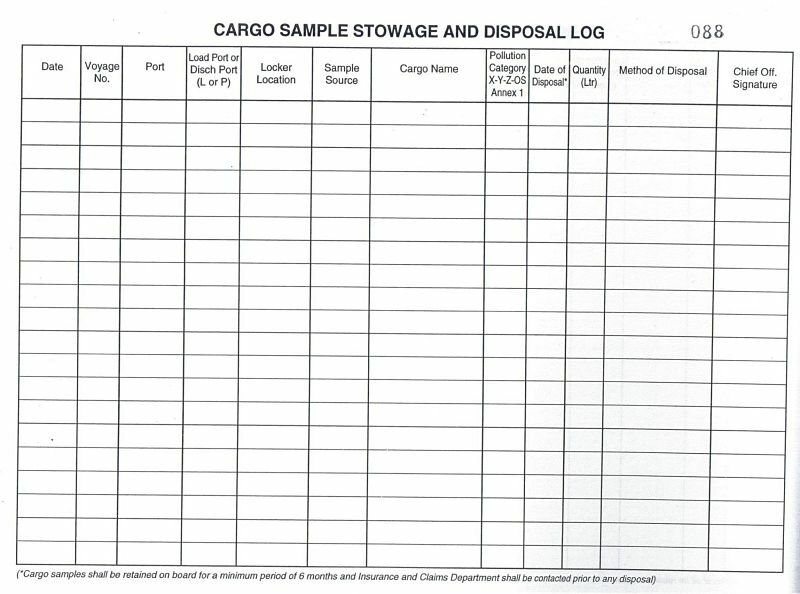 The samples are of no value if these do not represent the actual cargo the vessel is loading. For example, of what use the samples will be if these were taken into a dirty sample bottle. Or into a bottle which had traces of water inside. So how to ensure that samples drawn are true representation of the cargo on board ? Each element of the sampling process must be clean to such an extent that it does not contaminate the sample. For example, the sample bottle must be clean, dry and free of moisture. One way to ensure that is by rinsing the clean sample bottle with small quantity of cargo itself. Apart from the sample bottle, hands of the persons involved can contaminate the sample. People involved in the sampling process must wear clean latex gloves while sampling. Sampling must not be carried in rain and dusty environment. If vessel cannot avoid that, we must ensure that no rain drop or dust goes into the sample. 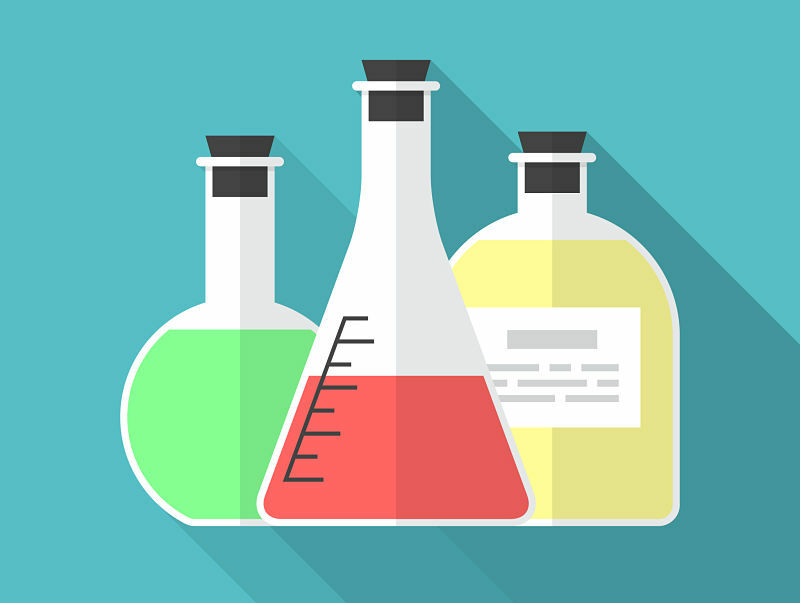 A glass sample bottle is best for chemical samples as other materials might react with chemicals. Moreover glass bottles are transparent and so easy to inspect the samples visually. Each Sample should be of minimum 500 ml. Open sampling is done with tank dome open. Open sampling is very common with cargoes such as palm oil. In this, a small container which is tied with a rope is lowered into the tank from the tank dome to collect the sample. Restricted sampling allows the sampling in closed environment but with small exposure to cargo and its vapors. There are different makes that provide restricted samplers. One of such is MMC restricted sampler. This sampler is attached to the same vapour lock from where ullages are taken. The sampler has a bottle attached at the bottom. This bottle has a ball which moves up when it touches the cargo and allows the bottle to fill with cargo. There is no exposure with the cargo or its vapours up to the point when sampler is removed from the vapour lock. After that we need to transfer the sample from MMC sampler bottle to the sample bottle. This is done by manual dumping of the sample. There are number of closed samplers in the market. And each of these are made in view of achieving one target which is no exposure to liquid of vapors while sampling. This is important while sampling toxic cargoes. One example of the closed sampler is this one from MMC. As we can see that we get the sample in the MMC sampling bottle just like restricted sampling. The difference between restricted sampler and closed sampler lies in how we transfer the sample into our sample bottle. 1) after drawing the sample, we bring the sampler tape in stowed position. 3) Lower the tape so that sample bottle is resting on the vapour lock ball. This will release the sample from the MMC sample bottle. 5) open sample transfer valve to collect the sample. The sample will flow into the bottle by gravity. 6) heave the sampler tape and open the vapour lock. This will release any left over of sample into the tank. 7) Close the vapour lock and remove the sampler and store it after cleaning. For taking the samples of a cargo which react with air/moisture, we can even purge the sampler. To purge, we can connect the nitrogen bottle (supplied by maker) to the sampler transfer valve. After purging the sampler,we can lower the sampler to collect the sample. IBC code chapter 17 does not specify the sampling methods for each cargo. But the sampling method can be associated with gauging. As per IBC code, there are three methods of gauging. These are open, controlled or closed guaging. We can easily correspond the gauging methods to the sampling methods. So as per IBC code chapter 17, if a cargo has the open gauging mentioned, we can do open sampling for this cargo. Same way, if a cargo has closed gauging as per chapter 17, we need to do closed sampling for this cargo. To know this, open chapter 17 of the IBC code and look for your cargo. Now look under column “J” for the method of gauging required. “O”, “R” and “C” represents open, restricted and closed respectively. Use of PPE during any operation on ships can never be over emphasized. Each company has a PPE Matrix for each activity each crew member must follow. Additionally for Sampling on chemical tankers, we must wear full chemical suit and SCBA when handling toxic cargoes. IBC chapter 17 identifies if a cargo is toxic or not. 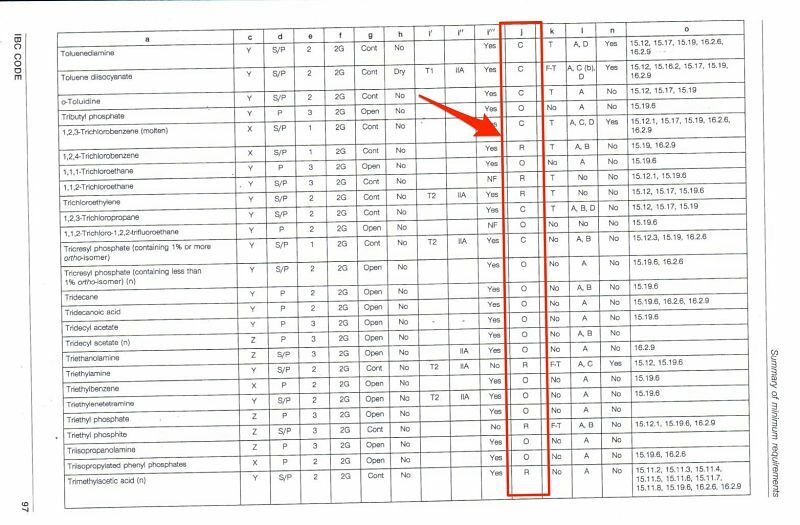 To know if a cargo is toxic or not, look at the column K of the chapter 17 cargo list. alphabet “T” represents that the cargo is toxic. In all the cargoes with “T” in this column, full chemical suit with SCBA must be worn during sampling. We must label each sample with all the possible data and then store these samples in designated compartment only. It is company’s responsibility to provide sample label sticker which can be pasted on a glass bottle. 1) Vessel need to have a sample locker situated in the main cargo area (IBC 16.5.1). 3) Sample locker to be of chemical resistant material. If there is any part of the sample locker made of materials like wood, this need to be changed to chemical resistant material. Cells made of stainless steel are the most suited for this purpose. But if the vessel is only carrying certain products such as palm oil, these cells can be of reinforced plastic. 4) Sample locker to have ventilation arrangement. The ventilation need not be “forced ventilation”. But if the natural ventilation is used, there need to be a flame screen on the natural vent. 5) Sample locker need to have Fire extingushing arrangements such as sprinkler system. 5) Uncompatible samples should not be stowed close to each other. For example Acids and caustic sample should have a vertical separation in the sample locker. 6) Samples which are not required should be disposed and not kept unnecessarily. Sample shall not be retained on board longer than necessary. So for how long we should keep the samples on board? Each company should have a sample disposal policy which outline procedures for cargo sample disposal. This will also outline the period for which vessel need to keep the sample on board. The sample disposal policy reflects the time frame in which receivers can make a cargo claim. As per the industry practices, no claim for cargo damage be made after six months of date of discharge. So most of the company’s policy allows sample disposal after six months from discharge date. But this is not the case with toxic cargo samples and samples of polymerising cargoes. Most of the companies allow disposal of these samples after discharge operation or maximum 1 month after discharge operation. Some companies have a procedure to seek permission from the claims department before disposing any sample. In this case, ship staff need to send a request for allowing to dispose a sample. In this request the exact details of the sample (such as sample date, port and voyage number) need to be sent. Vessel can land the samples ashore. Even though this is not a viable option as no one accepts the ship’s cargo sample. But in any case, if possible we can consider this sometimes in case to case basis. We can drain samples into cargo tanks carrying same product if cargo is not sensitive. For example, if the vessel is carrying palm oil in the tank, we can drain palm oil samples into this cargo tank. The most appropriate method of disposal is during tank cleaning. The samples which do not react with the cargo previously in the tank being washed can be drained into the tank. It is important to maintain all the sampling activities. When was each sample taken and when and how vessel disposed this sample are the few things to record. Each company should provide sample log which we need to follow for each sample taken and disposed. Below sample log has all the elements a sample log need to have. Ship staff have a moral responsibility towards profit making of the Ship owners. 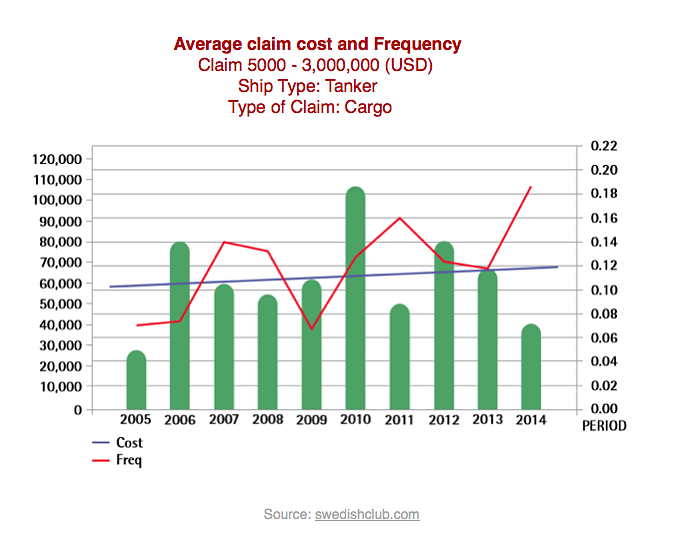 Cargo claims are the biggest reason for profit loss statement imbalance of ship owners. Though sometimes the claims are legitimate but many times they are not. Cargo samples are the only way to prove if a cargo off spec claim is legitimate or not. This shows how important the sampling process is. But if we follow the general guidelines for sampling, this could just be a routine operation. Thanks I m doing my orals. Ques. By looking from outside how will u differentiate betn 2 ships- One which is having DOA and one which isn’t having DOA. IS there any external marking. Well I have not been on bulk carriers but I don't think there is any outside marking for this. Useful information. Can you throw some light on the closed sampling arrangements at manifolds of a chemical tanker? Thank you. There are no closed sampling arrangements for manifold. 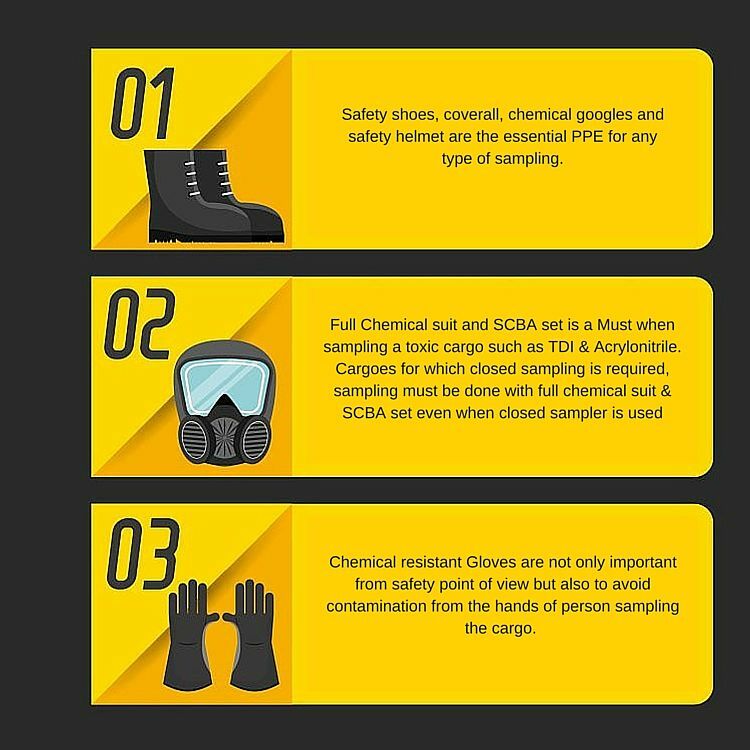 For this reason, generally manifold samples of toxic and corrosive cargoes are not permitted. Dear Capt Rajeev, i am so glad to see your blog up and running and indeed it is very detailed and informative. The first foot and final tank sample can be taken either by running the cargo pump or by dip sampling method. Can you advise which one is the recommended method and why? Both methods are widely used and nothing wrong with any one of these. However using dip sampling with closed samplers requires a lot of time as each time the sampler is lowered into a tank, it will draw sample to fill just one bottle. Considering the number of samples required these days, this method takes time. But this isn't case with cargoes for which we can do open sampling (such as palm oil). 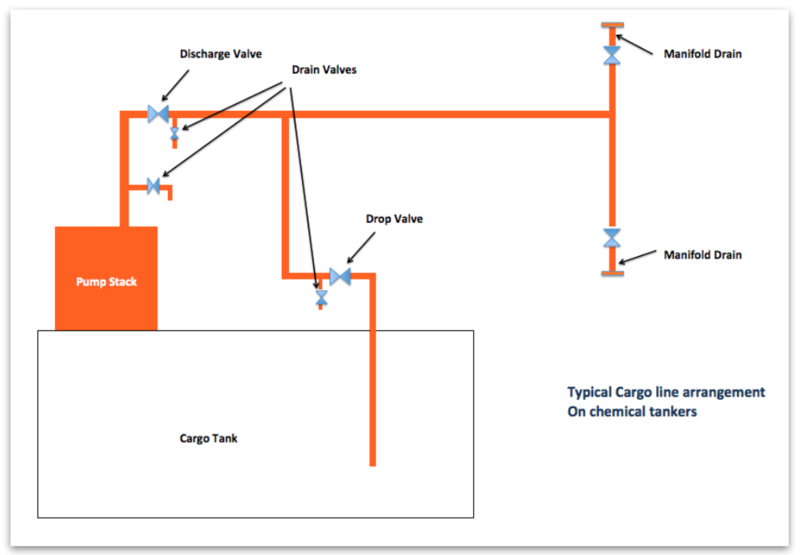 The problem with sampling by pump is if the cargo valves are leaking, it will fill the manifold line with cargo. There have been instances where cargo sampling was carried out with no manifold Blank and cargo spilled during sampling from the manifold because of leaking valves. Sampling of pump is also not recommended with solidifying cargoes such as Palm Styrene (Carriage temperature 70 C). This is because of obvious reason that if the cargo goes back in the manifold line it will choke the manifold line. Thanks Capt Rajeev for your prompt reply. i have another point to discuss here. recently i loaded a cargo in which water content as per tank bottom sample was very close(but less than) to max permitted. my concern is that by the time vessel arrives at disport more water may settle at bottom and a bottom sample taken at disport (whether by pump of dip) may indicate water content above the permitted levels. what do you think can be done to safeguard owners interests in this situation. In my opinion if we re-circulate the cargo before drawing the sample (by pump or by dip), the water content issue should not arise. We need to to make sure that we do not allow the water to settle down at bottom before sampling. thanks Capt Rajeev. 1. pls advise if pump stack samples are always taken and analysed in case of WW cargoes like MEG/MEOH or does it vary from terminal to terminal. 2. can you name some typical cargoes for which only amber colored sample bottles should be used. What is the additional feature of amber bottles over clear glass bottles? Terminal would in most of the cases not require pump stack samples. For them if manifold sample passes, their responsibility ceases. So usually it is Manifold samples, First foot and final samples. There are few instances where owner and/or charterers request pump stack samples. For example for cargoes that are Very expensive (nobody want to take a chance and want to know at each leg the quality of the cargo to minimise lose in case of sample fails) or very sensitive cargoes that require stringent cleaning requirement (more stringent than usual MEOH and MEG). One of such cargo is food grade Ethanol (the one usually loaded is industrial grade Ethanol). Since it is directly for the bottling and consumption, the pump stack samples are taken and analysed to ensure that quality of cargo entering the tank is OK. If it does not pass, then usually we drain few drums of cargo at the pump stack and check the sample again. This procedure is repeated and sometime close of 10 drums of 200 litres are drained before pump stack sample (in this case also called line sample) passes. Amber coloured bottles are used for cargoes that are affected by heat and sunlight. Like all polymerising cargoes. One such example is Styrene monomer. This is to avoid the sample heating up and loosing its quality. There are some other cargoes that changes color when under sunlight. The samples of these cargoes are also taken in amber coloured sample bottles. I do not see it as a written requirement anywhere but it comes under best practices of the trade. I am not sure of any other feature that these bottles may have. To add to this.. If the cargo is not affected by sunlight, clear view glass bottles are preferred because we can see any visible impurities in the cargo and the color of the cargo. For colourless cargoes such as MEG, MEOH this can give first indication if the sample is clear or not. thank you Capt Rajeev for your prompt and precise replies. Hi Joop, The Initial samples (manifold and first foot) are taken to ensure that tanks are clean and cargo will not get contaminated once loaded. These samples are sent to lab for analysis and only after analysis passes, the cargo is loaded. But the final sample after loading is for evidence of the quality of cargo loaded. Vessel need not wait for the analysis of final sample. This is common in chemical /Product trade. Hope it helps. What is the size of flame screen natural vent of cargo sample locker?